As the economy turns sour but my appetite does not, I have to start looking for places to eat out where it doesn't break the bank. 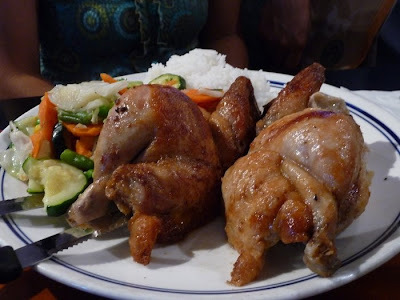 During my chicken kick, a friend of ours took us to Baccali Cafe & Rotisserie in Alhambra. I had no expectations going in since we were technically meeting for business. I was pleasantly surprised to see the large and extensive Chinese Fusion menu and even more pleasantly surprised to see how cheap everything was! The sandwiches are almost all under $5, and the big-portioned dishes were basically all under $10. Now, what's better than rotisserie chicken? If you're a New Yorker, you probably know about this already since so many bloggers and writers talk about it. But if you're visiting NYC and you have no clue where to eat but you want an awesome foodie experience, you better go to Jean-Georges for their $28 prix fixed lunch menu. Jean-Georges is more wildly decorated than a community christmas tree. It boasts 3 Michelin stars, 5 AAA Diamond awards, 4 stars by Frank Bruni from they NY Times, 5 stars from the Mobile Travel Guide, etc. etc. (you can read more about it on their website). I've never eaten at a 3 Michelin star restaurant (LA doesn't have any) and I figured it was going to be extremely expensive. I was surprised indeed when my friend told me that the two-course lunch is only $28 and I'd be able to add more courses for only $12 more. REALLY? That's cheaper than some undecorated rip off restaurants I go to in LA! I got to pick all 4 dishes and we were to share it, along with dessert and drinks. Is it just me or is this the new trend in desserts? Especially among Asian (or Asian-inspired) restaurants, the black sesame could be the new red bean! According to Betty Hall from LA Times, not only is the black sesame taking America by storm, it's wildly popular in Europe as well. Growing up, I've always had black sesame in my food. Many Korean dishes call for it, but never had I had it in a delicious dessert until I tried the Sesame Bean Sensation ($7.50) at Royal/T cafe, located in Culver City, CA. 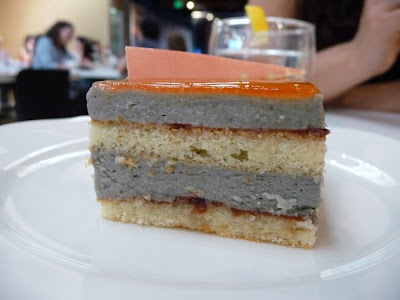 It was a layered cake with gray sesame cream filling. The nutty and sophisticated taste of the black sesame with the girly sweetness of the fruity cake got me hooked. Ever since then, I've been on the look out for black sesame anything. 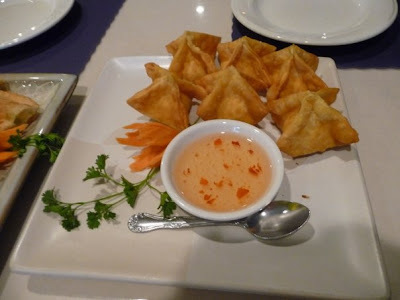 I never cared so much about crab rangoons when I lived in Wellesley, MA. I thought it was just standard Thai or Chinese fare. Once I moved out to Los Angeles and started reminiscing about my time spent in the East coast, crab rangoon would creep back into my mind. Funny, I never got to taste its creamy goodness ever since I moved out west. I started paying closer attention to the menus at Thai and Chinese restaurants but it was a lost cause. I couldn't find crab rangoons anywhere! I quickly gave up, thinking that it must have just been a dish Lemon Thai cooked up to put on their menu (much like "chicken in love"). 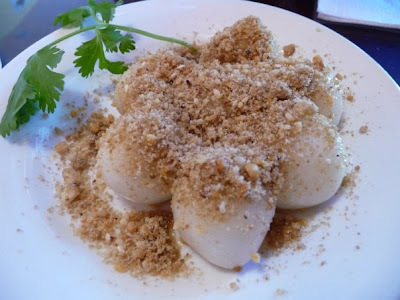 I resolved that when I went back to visit Wellesley, I'd stuff my face with as much fried wontons filled with cream cheese and imitation crab meat as I could. Once in a while, when I feel like pampering myself, I drive all the way out to San Gabriel Valley to get a $15 foot massage. Since it's a bit out of the way for me, I make sure I take half a day to get a massage, eat lunch or dinner (depending on the time of day), and then a "healthy" drink from Tasty, to top it all off. The plaza where Tasty is in has all these things so when I'm really lazy, I just get a foot massage here, eat and have dessert at Tasty's, and then take sticker pictures and call it a day. So what's so special about Tasty's? It's all in their desserts. I'm sure there are many more places like Tasty in SGV but in L.A., I have yet to find a place like this. They use fresh fruits for all their desserts, but the stand out to me is their drinks. I love festivals. It's a good reason to go out and spend a crap load of money just so you can go to a huge event with lots of sponsors, wait in long lines only to pay again to get the food, check out what the other girls are wearing, and eat all day. I decided to go to the LA Barbeque festival because 1) it was on the pier and anything near the beach is a huge draw for me 2) I was able to get cheaper tickets on goldstar.com, my go-to discounter for tickets for things going around town and 3) I was in the mood for some meat - especially for some out of town meat. My friends were telling me that I should post my food pictures up online somewhere, a place aside from facebook or xanga or yelp, where things are more organized and personalized to my adventures in eating. I worried about being a "food blogger". I mean, I know nothing about food aside from how good it tastes, how much enjoyment I get out of the experience of going to eat out, and how many more times I will go back to it. In my experience of traveling around and yelping my way through my hometown, L.A., I've realized that I've frequented quite a lot of of establishments - most of which are deemed worthy to visit by foodies on yelp.com, chowhound.com, citysearch.com, the famed food critic Jonathan Gold, my closeted foodie friends, and just word on the street.